WD's exclusive AllFrame 4K technology. All WD Purple drives are equipped with AllFrame 4K technology, which improves ATA streaming to help reduce frame loss, improve overall video playback, and increase the number of hard drive bays supported within a NVR. Future-proof your surveillance solution knowing that WD Purple is ready for ultra high definition cameras. With a workload rating of 180 TB/yr - three times that of desktop drives - WD Purple is designed to handle the unique demands of modern video surveillance DVR and NVR systems. Expand your view to 64. Designed for today's and tomorrow's surveillance solutions. Engineered for 24/7 operation in all sizes of mainstream surveillance DVRs and NVRs. With support for more than eight bays and tarnish resistant components, WD Purple drives deliver reliable operation in larger scale surveillance systems in harsher environments. Now on its 6th generation and with more than 15 million drives shipped, field-proven HelioSeal Technology delivers trusted high-capacity WD Purple storage (8TB and 10TB) for the massive storage needs of 4K surveillance video. Other Thoughts: Most of the "Eggsperts" are not experts at all. One even says base your purchasing decision on "warm fuzzy feelings and price per gigabyte"... lol. No. It's not that simple. Drives are not created equal. You absolutely will want a surveillance/NVR/DVR specific drive if you are building an NVR. They drop error correction to ensure the rest of your video streams continue being written, at the cost of a few frames being corrupted every once in a blue moon, which is exactly what you want. This is exactly what you DO NOT want in a general purpose desktop drive, or especially a NAS drive. So no, regardless of what anybody says, do not use these as general purpose or NAS drives, I don't care how good of a sale you found. You are likely to lose data, and you won't know it until you try to read that data. They also have pretty poor read speeds, which is not a problem at all when using it for what it's intended for. It will definitely be very annoying in a desktop though. WD Purples are among the best surveillance drives, and if that's your use case, you really can't go wrong. Very reliable, they'll last for years. Don't buy a general purpose drive, or you'll likely run into issues at some point. Pros: Quiet, fast, big storage. Cons: I had 8 Purple drives from 2TB to 4TB in my surveillance system. Not a single one of them lasted through the warranty period. Other Thoughts: WD replaced the drives that I sent in on time. The others I replaced with enterprise class drives designed to handle 550 TB/yr rather than the 180TB/year that these are rated. Purple drives are actually, in my opinion and experience, under-performing drives with low data ratings and 5400 RPM speed. For a 24/7 surveillance system you need the best drives you can buy. 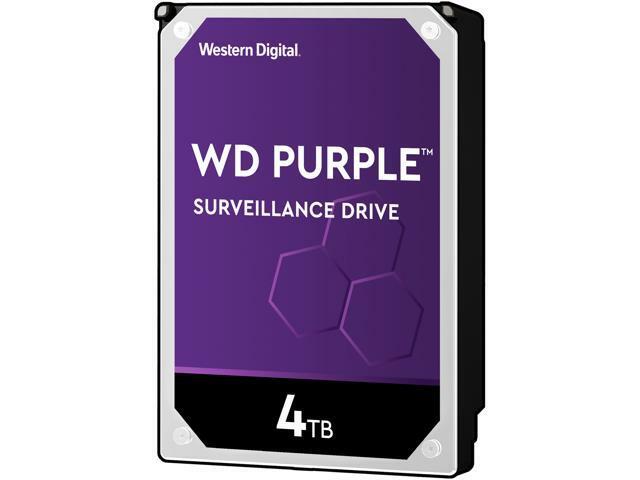 We are sorry to hear about your experiences with the WD Purple Surveillance Internal Hard Drive and thanks for your time providing this feedback. This issue can be better addressed better on the phone. Please contact us so that we can work together and provide an informed response for the issue. We would appreciate the opportunity to assist you directly. You can also reach out to our Helpline by dialing the number given below. Please ensure to provide the case number mentioned below with reference to NewEgg review in order to help us track your issue. Cons: Be aware that there's no value in going for the purples or reds unless your system supports them! Pros: Got it on sale and bought for sake of all the great reviews. Cons: Was defective out of the box making loud ticking noises and refusing to post ~ had to return it. Other Thoughts: Mine seems to have been an anomaly. We regret hearing about your experience with WD Purple Surveillance Hard Disk Drive and appreciate your time for providing the feedback. Best practice is to run diagnostics with Data Lifeguard Diagnostics for Windows when a drive does not perform as expected or is behaving abnormally. We have placed a few helpful links below providing more information for your convenience. "WD hard drive makes a repeated clicking sound"
"How To check If The Noise or Sound An Internal Drive Makes is Normal"
"How to check if a WD drive is damaged or defective"
We would like the chance to work with you directly to help address your concerns and help provide a good overall user experience. When you can contact us directly be sure to mention the support case number provided below as a point of reference to this review. Pros: Reliable, Low cost, Specifically designed for specific task with specialty parts. Cons: IT's a tool that works, can't even complain about price. Other Thoughts: I want to say something to joker that received DOA product and put 1 egg. I mean come on now. DOA happens all the time, RMA happens all the time I don't think it's fare and reflect product by doing this. I mean just think about is some joker can look at 1 egg and without even reading what happened go and get seagate or something and then what ? 4 months from now something happens and poor guy wont be able to load anything cause drive is no good 2 months back. I am joking, but in general it's REALLY bad idea to put anything one unless it's really garbage product and WD (any drive from them really) is top class. 6 out of 17 people found this review helpful. Did you? Other Thoughts: This went into a Sannce video surveillance system and has been working well for 5 months. The drive is in a bedroom closet so noise was a concern. Another brand HDD was very noisy and had to go, it's amazing how loud those little clicks become in the middle of the night. If you're worried about noise in your application then I would recommend this drive. Pros: Bought 2 of these drives in 4TB size for a hikvision video surveillance system thats been running just short of a year.The drives run cool to the touch and are very quiet.The video play back after months of storage is crystal clear and the drives are very responsive.